In August 2013, Joya de Nicaragua announced Blanco would be leaving Estelí for “his roots in the Dominican Republic.” Blanco later formed Las Cumbres Tabaco in partnership with Tabacalera Palma, operated by Blanco’s cousin, Jochi Blanco, in Tamboril, Santiago. The first Las Cumbres blend was officially launched June 2014—and it’s excellent. Called Señorial (Spanish for “lordly”), it boasts a Habano Ecuardor wrapper, a Nicaraguan binder from Estelí, and Dominican filler tobaccos of the Piloto Cubano and Corojo varieties. This summer, Las Cumbres launched Viktorsson’s first brand. Called Freyja after the Viking goddess associated with love, beauty, and fertility, it is intended to bridge Viktorsson’s Swedish roots with her passion for premium cigars. The blend includes a Dominican Criollo ’98 wrapper, a Mexican San Andrés binder, and filler tobaccos from Nicaragua and the Dominican Republic. 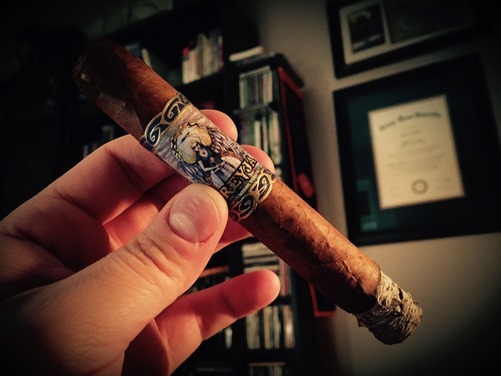 The Freyja Valhalla is a robusto (5.5 x 50) that retails for about $8 (yes, all four Freyja vitolas have names consistent with the Viking theme). Underneath its large, intricate band of gold and blue, it sports a moderately oily exterior that’s light brown, silky, and not without a couple large veins. Fairly spongy to the touch throughout, the pre-light notes remind me of caramel, syrup, and hay. The cold draw is smooth. After setting an even light with a wooden match, I find a harmonious, mild- to medium-bodied profile of cedar, pecan, creamy sweetness, and white pepper. Neither spice nor sweetness dominates, leaving the overall profile oaky, balanced, and interesting. As it progresses, both body and strength build to the medium level. The flavors also change a little throughout, with varying notes of sweetness coming and going, and hints of tea and clove at the midway point. The finale introduces some cinnamon spice. Construction is good—the straight burn requires no touch-ups along the way—though the ash is particularly flaky. According to Viktorsson, neither José Blanco nor Jochi Blanco helped her develop the blend; rather, Freyja was produced by the combination of Viktorsson and Geraldito Perez, Tabacalera Palma’s production manager. The duo has crafted a satisfying smoke that’s undoubtedly a solid first effort from Viktorsson—though, to my palate, it’s not at the level of excellence achieved by Señorial, which, to be fair, is one of the better blends I smoked in 2015. All things considered, the Freyja Valhalla earns three and a half stogies out of five.